Online software to track your spending and plan where it goes. Works on all devices using a browser. BudgetFocus is a web application that makes managing your money fit into the flow of your life. One small step to record your purchase is all it takes. Just come to this website, make a few clicks, and you’re on your way. BudgetFocus provides the right tools to get the job done. It fits smoothly into the flow of your life. The envelope approach is a time-honored, understandable way to manage your flow of money. Online envelopes mean your cash stays safely at the bank, BudgetFocus divides it among envelopes with a couple of clicks, and you can pay for items however you like: cash, checks, credit cards, or debit cards. Your communication with this website is encrypted, and there is no connection between BudgetFocus and your banks. We don't collect your passwords or account numbers. Those should be a secret between you and your bank. Your first step after starting our free trial should be to take a look at How to Make a Spending Plan and Stick to it. It's really a bootcamp that takes you through the process of setting up your finances in BudgetFocus and helps you think through where you are and where you want to go. We are not here to track your behavior and tempt you to buy more stuff with ads and offers. We have built a serious toolset to help you keep track of your spending and reach your financial goals. Would you like to give BudgetFocus a try? We have a 14-day free trial. See if it's right for you. No credit card is required. No recurring charges. This is a one-time payment. We respect your privacy. Email used for recovering lost passwords. Decide how much income should flow into each category. Your money goes to the bank and is split among envelopes at BudgetFocus. Record your spending with BudgetFocus. Your plan becomes a reality. You should make an envelope for paying off debt and put into it what you can afford. Each debt will have a minimum payment to service the interest. Put that much into the envelope plus extra for paying it off early. Dave Ramsey suggests an approach he calls the debt snowball. Put extra money toward paying off the smallest debt first. Then use all of that money to work on the next one. This will give you a big emotional boost as the process snowballs. This is an intentional feature and not something we plan to change. It makes the safety of BudgetFocus a no-brainer. The minimally small effort of keeping track gives you a fresh sense of how much you have spent compared to what's available. This is a huge value. 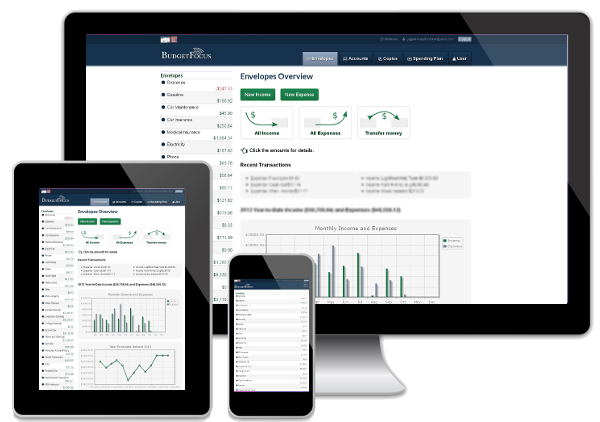 BudgetFocus is really a fund accounting system. Each envelope is really just a fund with a designated purpose. Money flows into the fund at some prescribed rate. You make purchases with money from the fund as needed. All the cash is actually pooled together in some bank accounts. BudgetFocus just provides the machinery to make it all work together. You can prosper with what you have if you can keep track of where your money is going and only spend it where you really want it to go. There is a time-tested, easy way to plan where to spend your money called the envelope system. Here’s a description of how it works, and then we’ll show you how doing online envelope budgeting takes care of the problems associated with the traditional envelope method. You collect some envelopes or other containers and write on the outside of each one the name of a category for which you spend money, like groceries, clothing, gasoline, or eating out. You bring your take-home pay in cash and divide it among the envelopes according to how much you need in each one. Typically you would write on each envelope the amount that you need to put in it from each paycheck. When you go to the grocery store, you take the cash from the grocery envelope. You know how much you have to spend. You can spend with confidence because you know there is enough in the other envelopes to cover your other commitments. If you want to spend more in groceries, you could take some money from another envelope like your vacation envelope. When you do that, you realize that it may mean changing your vacation plans. Either way, you're in charge and it's clear what you're doing. Using an envelope method allocates money to cover all of your financial commitments so you don't have to worry about those. It can also show you that some of those commitments are really not so important to you. For example, you may discover that you would rather not pay for cable TV because you have found a better use for that money. Having your cash divided among various categories acts as a guide to your purchasing decisions so that you can choose the things that you want and still spend less than you make. If there is money in your eating-out envelope, then you can go out. If not, then you know you need to wait. Staying out of debt is a truly great freedom. It also lets you save a little at a time for bigger purchases like Christmas gifts or vacation. Cash envelope problems solved by BudgetFocus. Lost or stolen cash Money stays at the bank. Carrying lots of cash Pay with credit or debit card. Where did my money go? Spending records shown by envelope and account. Hassle of physical envelopes and cash Your paycheck divides at the click of a button. The traditional envelope method keeps cash at your house, where it can be lost or stolen. You don't have the convenience of paying with a credit or debit card. And it's really easy to steal from yourself out of the other envelopes. There's no record of where the money went, so you can't go back and think about what's happening to your money. Also, dividing cash among those envelopes is a real hassle. So, doing this online solves all of these problems without losing any of the advantages of the envelope method. Your money stays at the bank where it's safe, and you can pay for things in the same way as you do now. If you buy something with a credit card, the money comes out of the envelope right away and you pay off the card every month as the bill comes. Debt is not a part of this picture...but getting out of debt is. Your income is automatically divided among your envelopes according to your spending plan. Entering your purchases is easy and quick. Because this is a website, you can do it wherever there is a web browser. There is no software to install and keep working. BudgetFocus.com keeps a record of all you do so that you can reconcile to your bank statements and you can reflect on what you've been doing and make changes to improve. BudgetFocus is a secure system with SSL encryption and no connection to your bank accounts. Online envelope budgeting is the easy way to prosper with what you have. You should start today; you'll be really glad you did.